Every Extend[a] is series of puzzle shoot 'em up video games primarily developed by Q Entertainment. The series began with a 2004 freeware game of the same name (also known as E2) for Windows, which was a personal project by Kanta Matsuhisa under the "Omega" pseudonym. Q Entertainment discovered the game online and approached Matshisa to develop a remix version. The remix version was developed for the PlayStation Portable and was released in 2006, titled Every Extend Extra[b] (or E3). In 2007, Q Entertainment developed and released a sequel on the Xbox 360 titled Every Extend Extra Extreme[c] (or E4). Xbox 360 version gameplay screenshot. In Every Extend, players control a ship with the only ability to detonate itself. Stages begin with a set time limit and enemies appearing on screen in randomized patterns. When the player detonates their ship and an enemy is caught in its blast radius, the enemy will explode and have its own blast radius that other enemies can get caught in, causing a chain reaction. The goal is to destroy the maximum amount of ships on screen by positioning and detonating at the right moment, setting off a chain reaction of explosions and earning combo bonus. The first enemy in a chain is worth 10 points and each successive blast doubles in value up to a maximum of 2560 points. Blowing oneself up takes away from one's overall 'stock' of lives. Additional lives are gained after a certain number of points have been obtained. The requirement to obtain lives increases after each new life gained. In Every Extend Extra and Every Extend Extra Extreme, each stage has its own unique music, background, enemy design, and bosses. It also adds varying explosion types to the Every Extend template, which can link chains in different ways, as well as a "charge" feature. By holding down the explosion button, players can charge the bomb; the longer the button is held, the larger the blast radius, expanding the possibility for chaining explosions. Quickens dropped by enemies increase the speed of both the player and the enemy, as well as the speed of that stage's music. Each stage is played out to a time limit, with a boss character appearing at a set point towards the end. Rather than attacking the boss directly, the player relies on destroying the required number of regular enemies near the boss to cause a 'hit'. Every Extend Extra adds four new modes: 'Arcade', 'Caravan', 'Boss Attack', with the original Every Extend labeled as 'Original'. In Arcade mode players must work their way through the stage and defeat the boss at the end in order to move on to the next stage. Arcade mode is made up of seven stages as well as two special hidden stages. In Caravan, players can choose from any of the stages that were previously unlocked in Arcade mode and compete for a high score. Boss Attacks has to modes: Solo and Rush. In Solo, players can face-off against a single boss. In Rush, players can battle one after another until all the bosses are defeated. Every Extend Extra Extreme comes in four main modes: 'E4: The Game Unlimited', 'E4: The Game Time Limited', 'S4: Wiz Ur Muzik', and 'R4: The Revenge'. E4: The Game Unlimited and E4: The Game Time Limited are the two main game modes. In "Unlimited", players can play as long as they want so long as they keep gaining lives, and extending time. In "Time Limited", players cannot extend time. In "S4: Wiz Ur Muzik" players can choose their own music stored in the Xbox 360 hard drive. In 'R4: The Revenge' players have the ability to shoot projectiles and attacking enemies directly, however the only hit that will count towards destroying the player is the green circle. Players can choose their movement speed and one of two modes of firing prior to the start of the game, "Four Way", and "Spread". Four way shoots projectiles from all points of your character, and Spread shoots projectiles from one specific point of your character. Players are tasked with destroying a set number of enemies until they encounter the "Boss Enemy". Destroying any enemy will give players slight amounts of "Level" which increases the number of projectiles that players can fire by one, to a maximum level of 20. every 25 stages, bosses 1-4 will have an extra one spawn with them, however the fifth boss has increased health instead. The final stage is 100. Both Every Extend Extra and Every Extend Extra Extreme offer multiplayer modes. Every Extend Extra offers multiplayer via PSP's ad-hoc mode and Every Extend Extra Extreme offers online multiplayer through Xbox Live. Every Extend was developed by Kanta Matsuhisa. He took inspiration from, Tetsuya Mizuguchi's own Rez when developing the game. The game began as a contest entry and took three months for Matsuhisa to develop. Matsuhisa used the first month using DirectX for the first time and Windows program to draw 3D polygons and exercising model techniques. The next month involved making the prototypes and testing them with Matsuhisa's friends. The third and final month was used creating finishing parts, making the boss and two levels. During the time developing the game, Matsuhisa was balancing life in college and didn't go to campus much as a result. A remix version of the game titled Every Extend Extra was announced in Tokyo Game Show 2005. Q Entertainment's Chief Creative Officer Reo Yonaga approached Matsuhisa via email on future plans for the game after the staff of Q Entertainment played the original version on PC. Decision to port the game into PSP was made in 2004 during the time that Lumines was being developed and Matsuhisa joined the development team as a game designer. The game was released as Every Extend Extra was due to adding new graphics, sound effects, gameplay elements, and a new soundtracks from various artists such as USCUS and O-Zone, creating an original game. Every Extend Extra also features the original PC version as well. The PSP version was localized by Buena Vista Games for North American and includes an exclusive soundtrack for one of the bonus levels. Buena Vista Games noted one of the difficulties of localizing the game was translating the names of the levels, bosses, and rankings from the names chosen from Q Entertainment. Namco Bandai released a trial version on PC as part of a contest to promote the game's release. The contest lasted from July 14, 2006 to August 17, 2006. A sequel to the game was released as Every Extend Extra Extreme for Xbox 360 via Xbox Live Arcade. Tetsuya Mizuguchi described it as a fever version of the game and a sequel to Every Extend Extra. Mizuguchi noted the most difficult thing during development was expanding on the scope of game while trying to confine to a download size that users will deem acceptable. Mizuguchi found it rewarding being able to create new modes and breathe some new life into the game for those who have already played the first game. The Original Every Extend was released for the PC on March 29, 2004 in Japan. The remix version, Every Extend Extra, was released for the PSP in Japan on August 13, 2006, in North America November 7, 2006, in Australia on February 5, 2007, and in Europe on February 9, 2007. The sequel, Every Extend Extra Extreme, was released for the Xbox 360 via Xbox Live Arcade on February 9, 2007 for North America and Japan. The game was re-released into physical form as a compilation by Atari alongside Rez HD and Lumines Live! titled Qubed. The compilation was released on September 19, 2009. Every Extend Extra was positively received among critics. The game earned an aggregated score of 74 out of 100 on Metacritic based on 45 reviews. Edge magazine awarded the game 8/10 in their October 2006 issue. They cited an obtuse initial learning curve and a "defiant obscurity and the resulting barrier to entry" as its main hindrances, but concluded that, overall, the game was "an undeniably exhilarating dance". Pocket Gamer had also gave the same rating of 8 out of 10, describing the game as "Effortlessly stylish, engagingly simple but deep and beguiling" IGN complimented the game for doing fine job of mixing arcade action with the depth of a serious puzzle game, however noted that it could use more more stages and a greater range of difficulty modes." Eurogamer gave similar complaints including their own complaints on the difficulty curve, but gave still gave the game praise, rating it an 8 out of 10 and stating "Every Extend Extra is another triumph of fast-paced puzzle gameplay" Gamespot gave the game a lesser score of 7 out of 10, stating ,"concept is kind of interesting, but the novelty wears out after a couple of rounds." However also complimented the game for the ability to grabbing their attention with its outstanding presentation. Every Extend Extra Extreme was also well received among critics and earned an aggregated score of 78 out of 100 on Metacritic based on 28 reviews. IGN gave the game an 8.5 out of 10, describing the game as "unique" and "trippy". Gamespot gave the game a 7.5 out of 10 complimenting the visuals, stating "It's as much an interactive lightshow as it is a game, and the flashing, spacey visuals in combination with the pulsing, electronic soundtrack make it a hypnotic and singular experience." Eurogamer was more negative towards the game and gave it a 4 out of 10, criticizing how easy it was to get on the top leaderboard and unable to do anything during chains. ^ a b c d e Every Extend Extra instruction manual (PDF). North America: Buena Vista Games. 2006. ^ "The Indie Shooter Roundtable: Mak, Cho, And Omega Fire At Will". Gamasutra. Retrieved May 17, 2018. ^ "Gaming Life in Japan". IGN. Retrieved May 16, 2018. ^ "O-Zone highlighted in Every Extend Extra". Siliconera. Retrieved May 16, 2018. ^ "Nobody Beats the Miz: Q Entertainment's Tetsuya Mizuguchi on Name Recognition (page 5 of 8)". Gamasutra. Retrieved May 23, 2018. ^ "Elaborating on Every Extend Extra". Siliconera. Retrieved May 16, 2018. ^ "『Every Extend Extra』PC体験版 ハイスコアランキング ゲーム大会キャンペーン". Famitsu. Retrieved May 19, 2018. ^ "Interviews// Tetsuya Mizuguchi (page 2 of 3)". SPOnG. Retrieved May 19, 2018. ^ "Interviews// Tetsuya Mizuguchi (page 3 of 3)". SPOnG. Retrieved May 19, 2018. ^ "EVERY EXTEND EXTRA エブリ エクステンド エクストラ". Sony. Retrieved May 19, 2018. 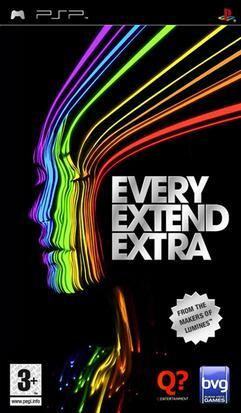 ^ "Every Extend Extra". IGN. Retrieved May 19, 2018. ^ "Atari to bundle Rez HD, Lumines Live, E4 in one retail box". Destructoid. Retrieved May 20, 2018. ^ "Qubed for Xbox 360". GameSpot. Retrieved May 20, 2018. ^ "Every Extend Extra for PSP reviews". GameRankings. Retrieved May 16, 2018. ^ a b "Every Extend Extra for PSP reviews". Metacritic. Retrieved May 16, 2018. ^ "Every Extend Extra Extreme for Xbox 360 reviews". GameRankings. Retrieved May 16, 2018. ^ a b "Every Extend Extra Extreme for Xbox 360 reviews". Metacritic. Retrieved May 16, 2018. ^ "Every Extend Extra review". Pocket Gamer. Retrieved May 24, 2018. ^ "Every Extend Extra review". IGN. Retrieved May 24, 2018. ^ "Every Extend Extra review". Eurogamer. Retrieved May 24, 2018. ^ "Every Extend Extra review". GameSpot. Retrieved May 24, 2018. ^ "Every Extend Extra Extreme review". IGN. Retrieved May 27, 2018. ^ "Every Extend Extra Extreme review". GameSpot. Retrieved May 27, 2018. ^ "Every Extend Extra Extreme review". Eurogamer. Retrieved May 27, 2018.